I was reading the Closet Cooking blog and saw the entry for Chicken and Roasted Pepper Panini. The sandwich looked so delicious I had to make it for dinner tonight. I grilled the chicken breast. 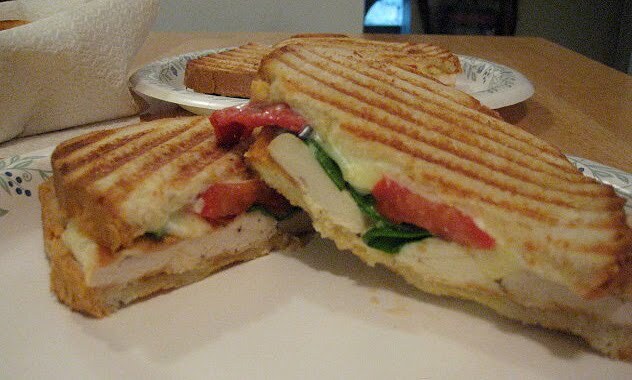 On Italian bread I spread some Feta cheese, added sliced tomatoes, roasted peppers and baby arugula salad mix and the chicken. Than I put the sandwich in the panini press. Also made a pan of sauce today and divided it up into individual servings. What's in the other pan? Tune in tomorrow night.